With its TZ series Lumix cameras Panasonic has pioneered the inclusion of broader focal ranges than usually offered by a digital compact. In practice this has made them most apt for candid and (amateur) wildlife photography, school sports days (at a push) at maximum zoom, plus landscapes at the wider end. 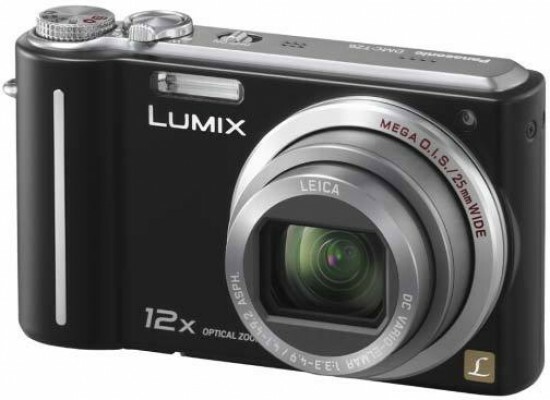 Panasonic has done this while delivering a small-ish form factor that, while no match for the sleek (Canon) IXUS's or (Nikon) Coolpixes of this world, is still compact enough to slip into your jacket's inner pocket. The 10.1 megapixel DMC-TZ6 is the latest example, and, like its TZ7 big brother announced in tandem (which adds AVCHD-format High Definition video, as opposed to the TZ6's sole Motion JPEG format), this camera boasts a wide-angle Leica-branded 12x optical zoom equivalent to 25-300mm in 35mm terms. This has been achieved, says its manufacturer, courtesy of a lens construction comprising 10 elements in 8 groups, including two ED lenses and two aspherical lenses with three aspherical surfaces. With that whopping range in mind Panasonic is ambitiously pitching the TZ6 as your perfect travel companion - despite the fact that it can't also play your MP3's or carry your suitcases. For an asking price of £265 / $299, the TZ6 features the company's beginner friendly iA (intelligent auto) functionality also found on the higher-end G1/GH1, which automatically adjusts settings dependant on the subject the camera is presented with (for example choosing 'macro' when faced with a flower). It also has much needed optical image stabilization (Mega OIS) on board to avoid blurred images when shooting handheld in dim lighting without flash or at the telephoto end of the zoom. New this time around is an AF tracking function that allows the user to lock the focus on a moving subject and keep it there without needing to keep the shutter release button half depressed, plus an automatic backlight compensation function that adjusts exposure if a subject is in danger of being thrown into silhouette. Face detection has also been tweaked so that the TZ6 can now lock onto target even if said visage is turned sideways to the lens. The combination of the above pretty much allows for simple, point and shoot operation. For those looking to use the 300mm equivalent telephoto end for wildlife or sports photography, the TZ6 offers a continuous shooting speed at maximum image quality of 2.5 frames per second. Though that's so-so, if rapidity of capture outweighs detail required, then a High Speed Burst mode ups this to between 6.5 and 10 fps, resolution dropping to 3MP for standard 4:3 ratio images. Thankfully if wanted the user can keep shooting sequentially until the card is full. With a construction of metal and plastic, like the FX150 we rated last month the TZ6 subconsciously suggests its asking price is about right by feeling reassuringly solid in the palm with lithium ion battery and optional SD (or higher capacity SDHC) media card loaded. Practically speaking, a raised vertical sliver at the front of the rounded grip provides a means of purchase for the fingertips with the camera gripped in the right hand, while the thumb comes to rest on nine raised nodules forming a square at the back. On the whole the camera's design is attractive, though conservatively so, our review sample blending silver and grey with standard rectangular dimensions. Surely, Panasonic seems to be saying, the fact that we've crammed a lens this large into a body this diminutive is enough? Unlike the higher resolution, physically smaller (and approximately £30 more expensive) FX150 however, the TZ6 omits fancy tricks like that camera's 'E.Zoom' button that propels the lens from maximum wideangle to telephoto. That's not to suggest the TZ6 is frill-free in comparison, though the 'extra optical zoom' function that extends the range to a 21.4x equivalent by utilising the central portion of its CCD – in effect a crop with a resultant resolution drop to three megapixels – is probably best avoided. With its appearance obviously dominated by the wide-angle lens, the TZ6 does however present an unthreateningly clean faceplate to the user, the full extent of the zoom hidden within the body when not in use. Top right of this is a pinhead-sized window that (typical for this class of camera) doubles up as the self-timer indicator and AF assist lamp. Top left of the lens is a lozenge-shaped sliver for the built-in flash, and, apart from the 'L' for Lumix logo and mirrored sliver of metal running from top to bottom on the rounded grip to the left, that's it for detailing on the front of the camera. Moving to the TZ6's top plate, matters get a little more interesting, with, set into a different coloured silver-grey strip we find a rangefinder-alike mode dial nestling next to a shutter release button with just the right amount of 'give', itself encircled by a spring-loaded rocker switch for controlling the zoom. A small on/off power switch comes next and is partly recessed, with a raised lip providing sufficient purchase for a fingernail. Flick this to 'on' and the compact powers up for action in two seconds, the rear 2.7-inch, 230k dot LCD blinking into life as the lens extends to maximum wide angle setting in anticipation of the first image capture. As with most consumer cameras nowadays, no optical viewfinder is provided as a power-saving alternative to deploying the LCD 24:7; the screen's performance is as acceptable as any when shooting in daylight, though despite Panasonic's claim for it automatically adjusting its backlight dependant on surrounding ambient levels, when outdoors you still find yourself cupping a hand around the screen to properly scrutinize whether the desired result has been achieved. Give the shutter release button a squeeze however and the camera is quick to determine focus and exposure and fairly accurate it is too. That being said, in my coming to use the TZ6 (unfairly) immediately after the Nikon D3x DSLR, you realize it's not lightning fast by any means. The shutter delay as you go on to take the shot however is indiscernible, while a full resolution, least compression JPEG is written to memory in around three seconds, the screen freezing whilst this is taking place. Again, this is hardly class leading but perfectly adequate for the happy snapper market, processing handled (among other tasks) by the camera's Venue Engine IV, the same processor found in the FX150. The zoom action itself is smooth and steady, sound tracked by only the faintest of mechanical noise, with the transition from maximum wide angle to telephoto setting taking just three seconds if holding down the lever. Adjacent to the on/off switch is a mono microphone for recording sound alongside video clips, while a built-in mono speaker concludes the features found on the camera's top plate. Moving back to study the rather loose-feel shooting mode dial in more detail, the user first has the choice of aforementioned intelligent auto mode. Press the menu button at the rear when in this mode and access is provided to the pared down record folder options of picture size, single or sequential shooting, plus colour mode – the choices here being black and white or sepia alongside standard colour. The set up menu can also be accessed, though this too is drastically simplified, only allowing the setting of the camera's internal clock, turning off the operational 'beep' and selecting language. The option that follows next on the dial is 'normal' picture mode (regular auto mode), the AF point/s highlighted in green when focus/exposure is determined with a half press. The menu folder options in this mode are more expansive, with the user being able to select an intelligent ISO option – limited to ceilings of either ISO 400, ISO 800 or ISO 1600 max – alongside the full manually selectable gamut of ISO 'proper', running from ISO 80 up to ISO 1600. White balance, metering mode (multi segment, centre weighted or spot) are also capable of being manually tweaked, the image aspect ratio can be switched from 4:3 to 3:2 or to a widescreen 16:9, while 'intelligent exposure' can be turned on or off as desired. Within the set up menu folder the regular suspects are found – including the ability to call up a compositional grid onscreen or a live histogram to check exposures before firing the shutter. Next around the dial denoted by the letters 'MS' is a 'MyScene' mode; as it sounds this allows the user to assign the most frequently-used scene mode option to this setting – very probably portrait or landscape give the camera's consumer market – and therefore instantly recall it with a twist of the dial. This setting feels slightly superfluous however, as next around the dial is the complete range of scene modes, providing the user with two screens' worth of cartoonish, icon-led options. Whichever option you've selected last will be there again when you come back to that mode. Like Olympus' E-30 with its choice of selectable art filters, the TZ6 has added film grain and pinhole camera a-like options to the 27-strong mix, that equally unusually includes a starry sky option along with not one but two separate baby settings that allow name and age to be assigned to an image. Both these settings use a weak burst of flash to bring out flesh tones. Continuing anti clockwise around the mode dial we reach the grandly named motion picture mode. Though it doesn't go the whole hog and offer full HD movies, the TZ6 does boast a wider-than-average choice of 16:9 ratio WVGA (848x480 pixels), VGA (640x480), or QVGA (320x240) resolution movies at a respectable 30 frames per second. Even better, the full extent of the optical zoom can be accessed when shooting movies, making it as versatile (almost) as a lower end camcorder – the image at maximum zoom commendably wobble free when shot hand held as our test videos, um, testify. The last dedicated mode on the dial is, rather bizarrely, a 'clipboard' option for taking low-resolution snaps of maps and timetables to avoid the need to make handwritten notes or doodles when in transit. These images are saved automatically to the 40MB internal memory. It's the kind of feature normally ferreted away amongst the rest of the scene modes on other compacts, but here given pride. I suppose it helps give added credence to Panasonic's 'perfect travel companion' claim for the TZ6. We move next to the TZ6's back plate, and, with the 2.7-inch screen taking up two thirds of the 'real estate' we are presented with some plastic, surely unnecessarily small buttons and controls ranged to the right. At the extreme right top hand corner is a record/play slider switch for alternating between image capture and review. Unfortunately should a possible image suddenly present itself whilst you're in the midst of reviewing shots, a simple press of the shutter release button won't throw the user back into capture mode: you have to physically change the setting; by which time the giraffe in question will have trotted off. Below this control is an easily overlooked pinprick for the status indicator light; it's easily overlooked because its position on the camera back means that it's almost certainly obscured by your thumb when shooting. The main focus of attention for the user is therefore the four-way directional control pad requiring fingertip operation just below, with familiar menu/set button at its centre. Used in the main to tab through onscreen menu items or images in playback, the set up here is the same as that of Panasonic's FX150: a press of the top button set at 12 o'clock when in capture mode brings up an exposure compensation slider on screen with the ability to adjust between +/- 2EV. 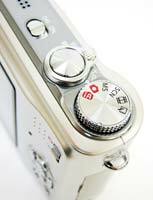 The button directly beneath is for switching to macro mode for shooting subjects as close as 3cm, the button on the left for selecting self-timer modes, while the one to the right of the menu/OK button is for selecting flash mode options. In iA mode the user is merely confronted with the ability to turn auto flash on or off, while if turning the shooting mode dial to 'normal' capture, a wider variety of five flash choices are offered: auto, auto with red eye reduction, forced flash, slow sync with red eye reduction or off. Press the centrally located 'menu' button within capture mode and, as mentioned previously, shooting and set up folders appear in tandem onscreen, each option clearly spelt out to the viewer/user. The final two buttons at the rear of the TZ6 are the same as those found on Panasonic's FX150 and FX35 compacts; marked with the self explanatory 'display' and the less familiar 'Q.menu'. The second right hand control is not a 'quality' menu as first might be assumed, but a 'quick menu' that summons up a drop-down toolbar running across the top of the LCD screen. As it indicates, this allows rapid access to the likes of white balance and resolution without having to otherwise navigate separate menu folders, a bit like the dedicated 'F' mode found on Fuji compacts, but more expansive. It's intuitive to use too, an adjective that could be applied to operation of the user friendly TZ6 as a whole. Moving to the base of this latest Lumix we find the expected screw thread for a tripod, plus a covered compartment with sliding catch housing both the rechargeable lithium ion battery and optional media card. The pack supplied provides a CIPA certified 320 shots from a single charge which is slightly better than average, though not the very best. While the left hand flank of the camera – if still viewing it from the back – is devoid completely of controls, the right hand side by contrast features a door covering a compartment housing a slot for the combined USB/AV lead supplied in the TZ6's box. There's space beside it for the HDMI port supplied on the TZ7, but no such feature is provided here, leading this reviewer to ascertain that this camera is simply a pared-down version of its bigger brother, using the same shell and outer chassis. That's not to say the TZ6 isn't worth closer examination in its own right. Indeed, having such a broad focal range on offer shouldn't be underestimated – there's always some action happening in the distance that would otherwise be missed if not for such a reach, and being able to get in closer also avoids the need to otherwise crop and so lose out on resolution. But what of the images themselves – has cramming such a broad focal range into a small space resulted in acceptable if inevitable compromises, an unparalleled performance, or delivered a dud?